The main project area, promoted by the Metropolitan administration of Barcelona, includes a beach 14km long on the Llobregat delta. This beach has a population of 64,000 inhabitants within 2km reach, and a metropolitan population over 4 million inhabitants. The project at Calafell (50km south Barcelona) is promoted by the city council and has included the excavation of a coastal lagoon to get the sand to construct a new dune ridge. Constructing and maintaining semi-fixed dunes on heavily used urban beaches to optimize the flows of ecosystem services, through collaboration with administrations and stakeholders. Dunes play a central role in coastal defence and protection against sea level rise linked to climatic change. Stakeholder mapping and social research will be used to learn how to shape social attitudes to make the year-round intensive recreational use of beaches compatible with the protection of the dunes. Involvement of administrations and local media interest. Hybrid dune strategy emerging as a viable alternative of coastal defence against erosion and sea level rise. Dunes are an issue of interest for schools and for citizen science. Providing benchmarking instruments of social listening and new ways to initiate conversations between administrations and other stakeholders. 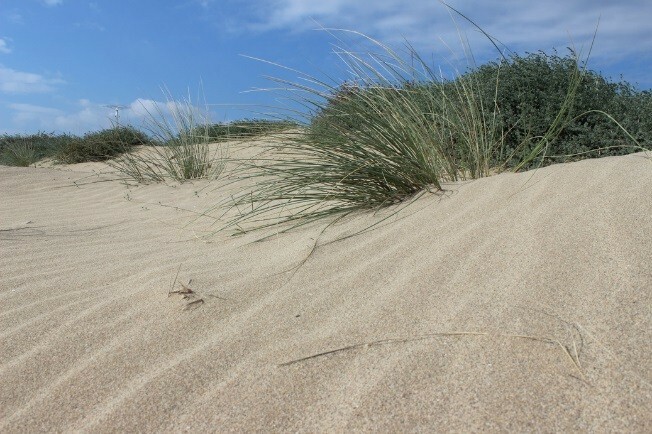 An integrated methodology involving complementary interaction systems (dune-beach, marram grass-dune, social use-beach and dune) to get a simpler way to manage such a complex environment. Providing an adaptive management strategy of coastal defence which is based on the management of the emerged beach sand budget.